My family loves Asian inspired meals and especially loves fried rice. We used to spend a ton of money ordering take out until we discovered Ling Ling Fried Rice. 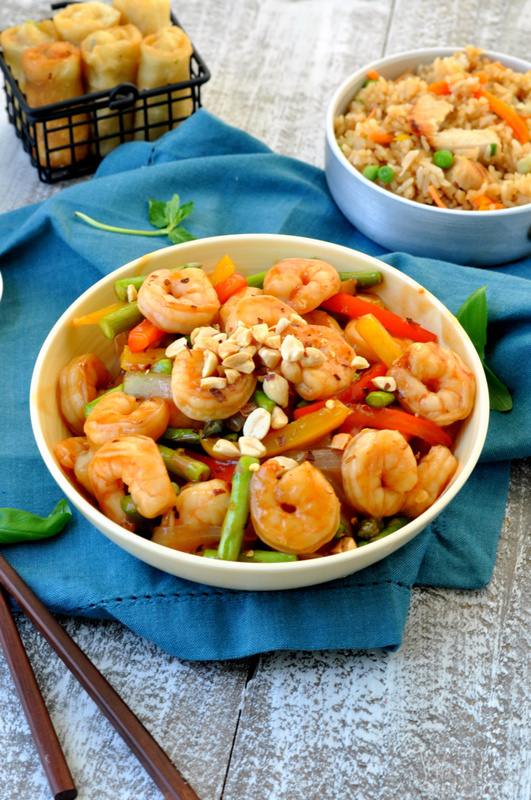 Now, I can make our favorite Kung Pao shrimp at home and enjoy it along with perfect fried rice. The Ling Ling Fried Rice line features five unique dishes based on pure and authentic Asian inspired recipes from Japan, China, Korea and Thailand including Yakitori Chicken, Yakiniku Beef, Thai-Style Chicken, Chinese-Style Vegetable, Bibimbap Beef. Ling Ling Fried Rice uses an infusion cooking method where each grain of rice is infused with Ling Ling signature sauces making it difficult to tell it from our usual take out fried rice. 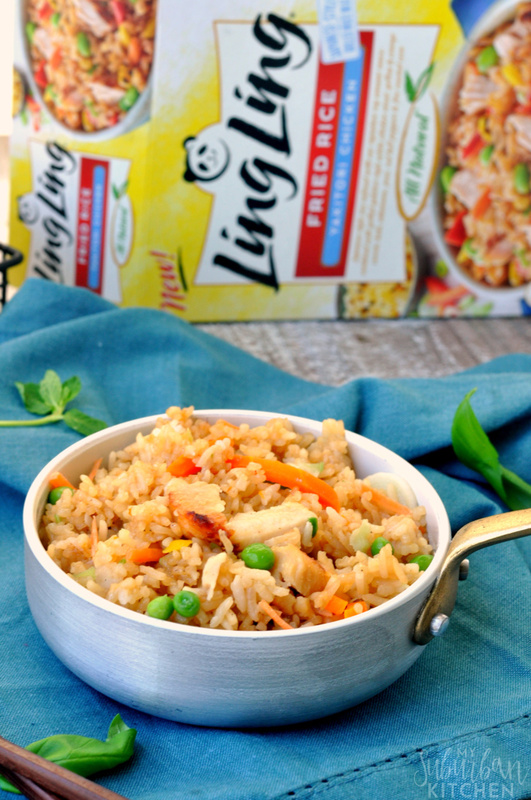 Together or on its own, Ling Ling Fried Rice makes staying in feel like going out. 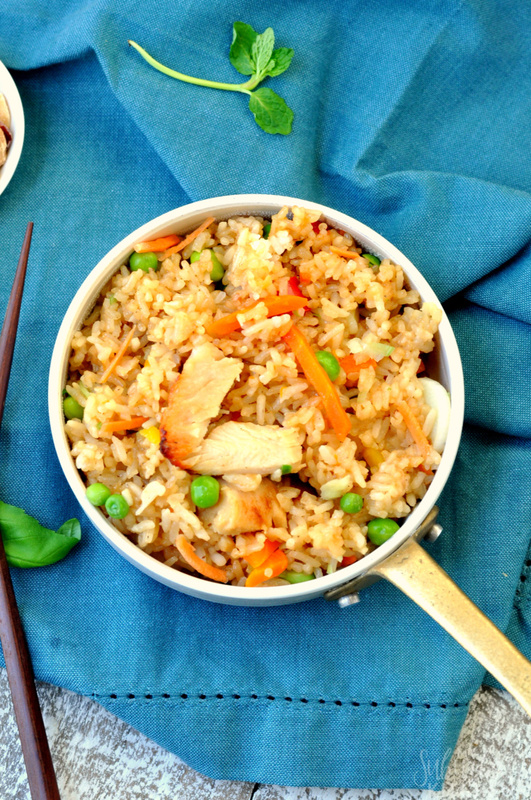 The Chinese-Style Vegetable Fried Rice goes perfect with our favorite Kung Pao shrimp but we also buy the Yakitori Chicken version too because the kids love it the most. 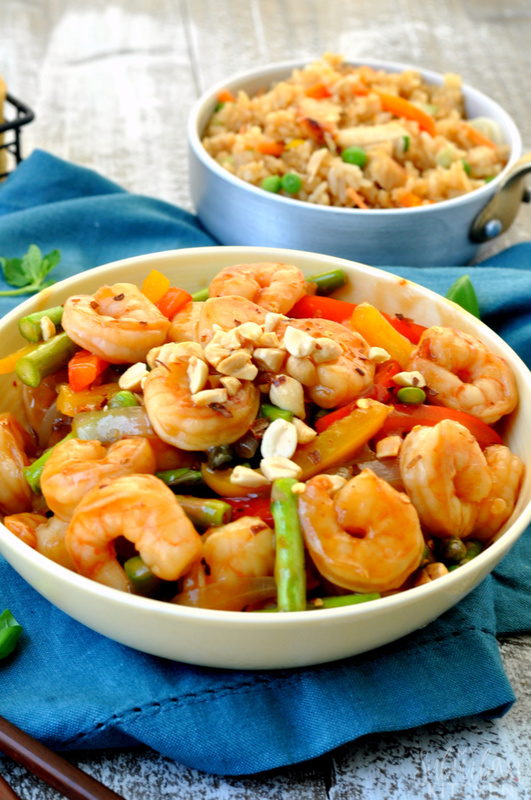 The best part is that we can have an entire meal of Kung Pao shrimp and perfect fried rice ready in under 15 minutes. 1. In a medium bowl, whisk together all ingredients for the sauce/marinade. Reserve 3/4 cup of sauce/marinade in a separate bowl. Add shrimp to remaining marinade and let sit for 10-15 minutes while you prep the remaining ingredients. 2. Heat 1 Tbsp sesame oil over medium-high heat. Add onion and sauce for 2-3 minutes. Add bell pepper and ginger and cook for an additional 2 minutes. 3. Add shrimp to pan and cook for 3-4 minutes. 4. Whisk 1/4 cup water and 1 1/2 Tbsp cornstarch into the reserved sauce. Add to pan along with asparagus and simmer, stirring frequently, until sauce has thickened and shrimp are fully cooked. 5. Garnish with peanut and serve with Ling Ling Fried Rice. 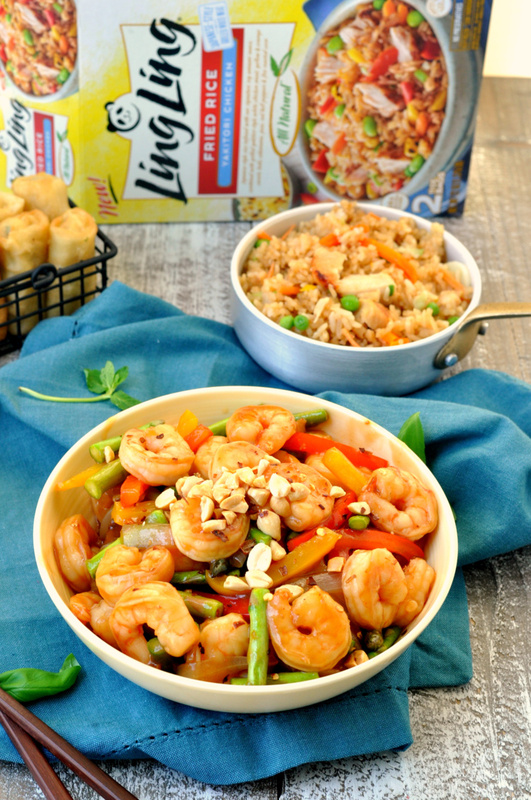 This Kung Pao shrimp, when paired with Ling Ling Fried Rice, is sure to make your whole dinner table squeal with delight. You don’t even have to tell them that it isn’t take out from their favorite restaurant. The fried rice will taste so good that they won’t even know. Be sure to visit the Ling Ling Fried Rice website for more information on their infusion cooking method all the varieties they offer. You can also print a coupon for $2.00 off of a box of Ling Ling Fried Rice. In a medium bowl, whisk together all ingredients for the sauce/marinade. Reserve 3/4 cup of sauce/marinade in a separate bowl. Add shrimp to remaining marinade and let sit for 10-15 minutes while you prep the remaining ingredients. Heat 1 Tbsp sesame oil over medium-high heat. Add onion and sauce for 2-3 minutes. Add bell pepper and ginger and cook for an additional 2 minutes. Add shrimp to pan and cook for 3-4 minutes. Whisk 1/4 cup water and 1 1/2 Tbsp cornstarch into the reserved sauce. Add to pan along with asparagus and simmer, stirring frequently, until sauce has thickened and shrimp are fully cooked. Garnish with peanuts and serve with Ling Ling Fried Rice.